It is easy to make the WPF Gantt slow, just bog it down with lots of time items that has lots of details (complex internal markup). 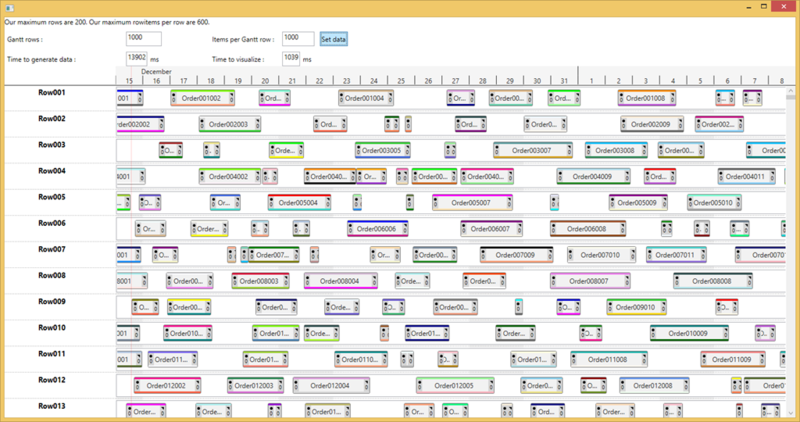 This article is about how to make the WPF Gantt really fast. 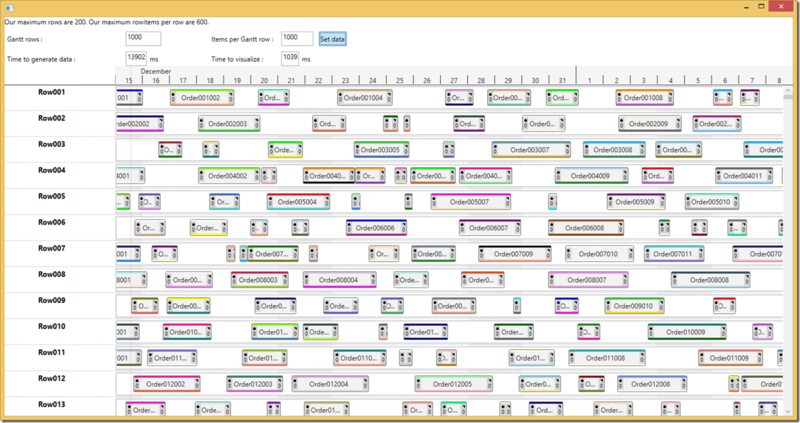 The Gantt rows can be optimized by limiting their rendering to only show the ones on screen. This is handled by standard WPF Virtualization implemented by VirtualizingStackPanel. Doing this will stop WPF from wasting time on stuff that is not currently on screen. And WPF will create the GanttRows when scrolled into view. The Time items are not in a StackPanel so we need to use a different technique. We need a way to decide if a should be on screen or not. We do this by implementing the event OnVirtualizeTimeItemCheck. In this event we get information about the bound object – that YOU know how to interpret – and the ability to say if it should be visible or not. We inform the Gantt that it should not be visible by setting e.SuggestedVisibility to Collapsed. The easiest way to decide if it should be on screen is like above: If the start is smaller than stop of view AND the stop is bigger than start of view. This covers the cases when time items are partly on screen, and when time items span the whole screen and beyond. If you have large datasets like 1000 rows and 1000 time items per row – you really have to follow these guidelines. But you see good effects long before that. Below 1 million Time items – Gantt still renders fast. This entry was posted in GTP.NET.SL WPF FAQ and tagged Performance by hasse. Bookmark the permalink.